So yesterday I promised I would share my swaps from Telford with you. Today I have the ones that I made to take with me, and I’m afraid you will have to wait for the ones I received in return, as I have not managed to do the pictures of them yet! I was very proud of my little swaps (they are 3″ square cards), as unlike some events where I have made swaps, I actually had some inspiration this time around, and they didn’t take too much time or effort either! I love the effect of the interlocking gatefold, and the idea and method came from Julies blog which I told you about recently. I am planning on putting these onto the projects section of the site, but as this will not happen today then here is a very quick rundown of the supplies and techniques. The base card is the Naturals Ivory cardstock, cut to 6″ x 3″, and folded at 1.5″ and 4.5″, to form a cute 3″x3″ gatefold blank. I punched a small scalloped circle from Pool Party core’dinations card, with enough space around it to then punch a larger scallop circle with a hole in the centre. I put both of these pieces to one side while I stamped the teacup from the Morning Cup stamp set in Versamark ink, and then embossed the image using pewter embossing powder. I then coloured the cup with Pool Party and the saucer and flowers with Primrose Petals markers, blotting the flowers with a tissue so that any ink on the embossed line didn’t smear and spread across the image. I also stamped the “steam” above the cup in Basic Gray. I punched the cup image using the small scallop circle punch, so that it nested exactly inside the Pool Party circles. 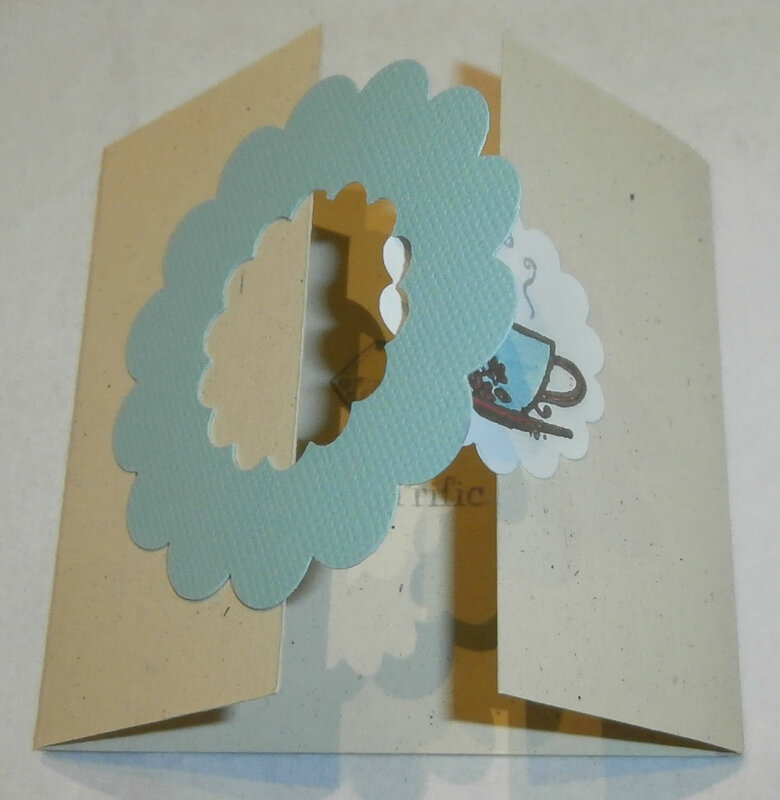 I stuck the card “donut” to the left side of the card, with half overlapping the fold, and the cup to the right side of the card in the same way, lining up the image before attaching it. 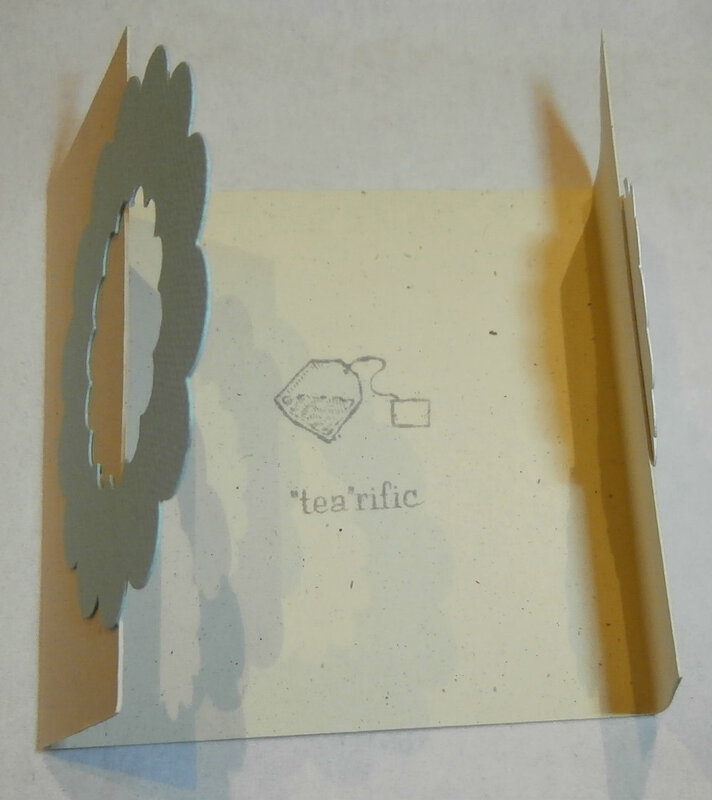 I then used two of the small stamps in the set, the teabag and the “tea”rific sentinent to embellish inside the card in Basic Gray. 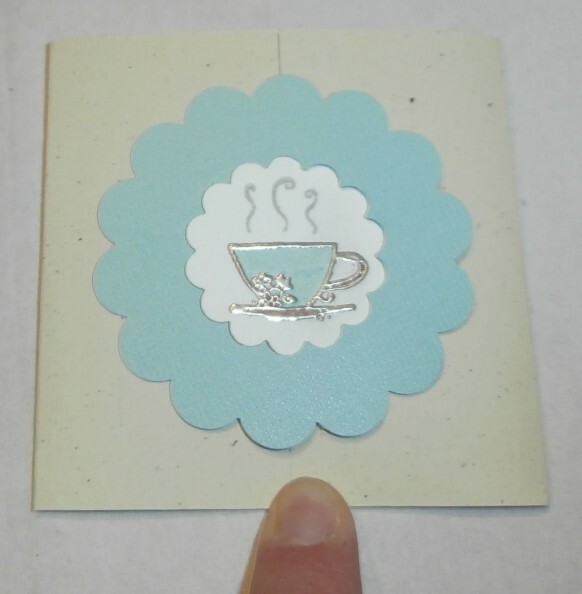 These would be great little cards to invite friends round for a cup of tea and a chat, don’t you think? Simple, effective, and cute. I was very proud of my little stack of card swaps – I made 25 in a short evening and am pleased with how they came out. I didn’t take a picture of all of them together, though. And one last treat for you, although I said you’d have to wait for the ones I received in return, the lovely Kylie has her swaps on her blog, so you can see them today! I have a yellow one. I love how Kylie has attached the handles of the bags with brads, it makes them much more practical for storage and less likely to be damaged. Thanks for swapping with me! Punch: 1-3/4″ Scallop Circle Extra-Large. Colours: Basic Gray, Pool Party, Primrose Petals. Accessories: Bone folder, Naturals Ivory cardstock, Pewter embossing powder, Stampin' Trimmer, Versamark ink.